Tales of the Trees: Easter Candy! It is Easter time once again and I love it! Each Easter morning my sister's and I would wake up and find our Easter basket that had been hidden by the Easter bunny. Side note: this could be why I am scared so easily as an adult, I was led to believe that a giant bunny came into my house and left me candy. Why did that not scare me silly as a child? Anyways, we would find our basket of goodies, then get ready for church in our matching outfits. I still have nightmares of wearing mathing outfits with my sisters. It was my mom's dream to have all girls, and when she had all girls she took full advantage of it. She would fix our hair all pretty complete with sponge curlers and lots of hairspray, dress us in our matching dresses, matching shoes, and matching socks or tights, and then out the door to church we would go. For a little kid there is no greater torture then giving the child a basket FULL of candy, and then making the child leave the house to go sit through church (which at that point in my life I found very boring). This could be why I have a problem with Easter candy to this day. I try not to keep any candy in the house, because if I do, I will devour it in no. time. flat. I gobble it up as if somebody is going to give it to me, and then make me leave it behind. I eat it before it can be taken away. First we have the peanut butter egg, these delicious eggs are stuffed FULL of creamy peanut butter, and combined with a diet coke, they are purely heaven. Next up is the Cadbury egg. Now this is one that I can't let an Easter season go by without eating. It is a tradition. And I love their commercials! Next is my year round favorite but it becomes extra special at Easter. I could seriously sit down and eat this whole bag in one sitting, and I have been known to do that. 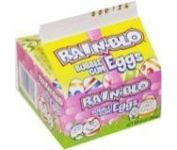 And finally, rainblo gum shaped like little eggs, there is nothing like topping off a peanut butter egg with a little gumball shaped like an egg! What is your favorite Easter time candy? Aww my mom used to give us a tiny baggie of candy to munch on during the service, haha! 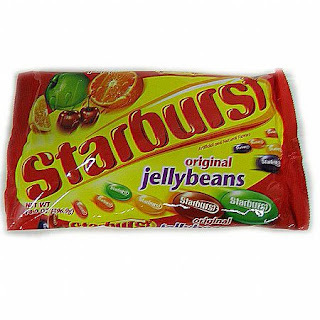 And if you love the starburst jelly beans, try the sour starburst ones! They are even better! 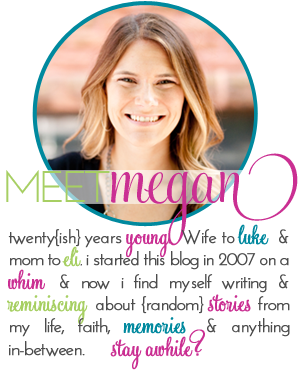 It sounds like we had pretty similar childhood Easters growing up! Oh I loved Rain-Blo gum!!! TOTALLY the pb egg with a diet coke. My FAVORITE easter time snack. Man oh man. I absolutely refused matching outfits. It wasn't even a discussion. I used to love Cadbury eggs, but a couple of years ago I think I reached my lifetime limit. I love the chocolate bunnies! There is nothing better than the EARS! My sister and I had matching outfits every year too. I kinda liked it as a kid (because I secretly wanted to be a twin sister), but now that I think about having my own kids- I don't know how I feel about dressing them the same. Oh well. Number 1 and number 2 are the best - I repeat- best candies in the world. The Reese's egg. I simply heart. Your childhood easters could be mine. But I had to coordinate with my brother. yuck! 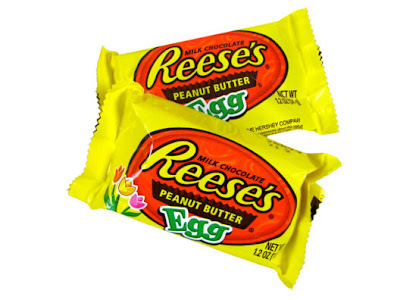 I LOVE the peanut butter filled eggs from Reese's. Peanut butter eggs and a diet coke...the best ever! Peanut Butter Eggs are my FAVE!! They are so much better than the reeses cups. Alex and I just finished off a 6-pack. I also have the Starburst jelly beans sitting around...my nephews love those. I wish I had as much self control as you and didn't keep the candy in the house, but I always have it sitting around in different jars and bowls. I remember wearing matching tights with my jelly shoes on Easter. HA! I'm so showing my age. Yumminess!!!!! I LOVE Cadbury eggs... I think because you can get Reese's anytime of the year.. but Cadbury eggs... once a year!!! I too had that same Easter schedule. I was only allowed one piece of candy before church too.. didnt want sugar buzzed children sitting in a pew! The Starburst Jelly Beans are the best! I also love the Milky Way Bunnies. I love love love cadbury eggs!! Peanut Butter eggs are the bomb dot com!!!! LOVE THEM! Mmm - you are making me want some chocolate; and your story about getting your Easter basket and then having to go to church reminds me of my family on Christmas. We were the ONLY kids in church who didn't have their new dolls or toys... my Mom did not allow us to open presents until after church - it was pure torture! I stock up on jelly beans this time of year! I love the Starburst kind! My favorite are the Cadbury eggs you talked about, but I love all Easter candy! reese's eggs are my absolute favorite. Dude, I feel really bad about this, but I ate all the Reese's Eggs that I bought for my nephews and brother one by one. At a time. Out of their baskets. Now they have no more. BUT they do have an assortment of candy (that does not include peanut butter and chocolate). So it's fine. You should try the Sweettarts jelly beans. Heaven! In jelly bean form! Haha too funny! You need to post pics ... of the matching days:) I love the cadurbury eggs in the purple bag best!! That was seriously torture to leave the candy behind while attending church! How unfair!!!! I am the same exact way! Seriously. We could be twins. I DON'T have candy anywhere in the house, because I will eat an entire bag before I even realize it's gone. I LOVE the peanut butter eggs. Peeps used to be my favorite, but I think I've overdosed on them a bit... people kept sending them to me during other seasons, which is just wrong in my opinion- peeps are little yellow chicks, not snowmen or whatever else! 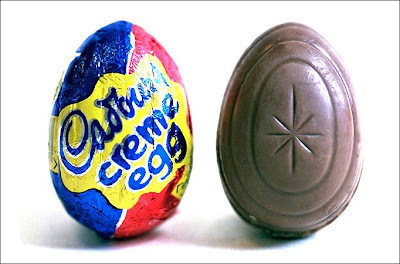 My dad always gave me one cadbury egg and it was one of the best things I ate all year. Cadbury Mini Eggs. I guarantee I would be at least 5 lbs lighter if they didn't exist. Luckily I'm not too fond of candy (and never have been) so my favorite childhood memory of easter was hunting for eggs and shopping with my grandparents to get a new Easter dress or outfit for church. However, I do love those peanut butter eggs (I think I light the saltiness of the peanut butter). Sweet and salty is a dangerouse combination for me! Those reese's eggs are the best! I also love the peanut m&m's. They are just so colorful and so hard to resist when they are sitting in a bowl on your coffee table. I am never buying a bag of those things again! I don't think I could survive the year withour having at least one Cadbury Creme egg! I even love their caramel eggs!